Artist's rendering of what HD 131488's inner planetary system might look like as two large rocky bodies collide. Inset illustrates the location of HD 131488's dust belts (top) and comparable regions to our own Solar System (bottom). In the searchfor other planetary systems like Earth that are capable of hostingextraterrestrial life, scientists have come across some very alien systemsindeed. But the latest ones have researchers truly perplexed. Newobservations have found evidence for planet formation around stars much moremassive than the sun, as well as dusty debris ? thought to be leftovers fromcollisions between rocky planetaryembryos. There?s a twist: The dust has a completely different chemicalmakeup from the composition of ourown solar system. These newfindings were presented this month at the 215th meeting of the AmericanAstronomical Society in Washington, D.C. The strangedust that shows different chemical markers than what we find in our ownneighborhood is in a star system about 500 light-years from Earth. The parentstar, known as HD 131488, is surrounded by warm dust in a region called the terrestrialplanet zone, where the star heats dust to temperatures similar to thosefound on Earth. Infraredimaging and spectroscopic measurements of the system, performed by the GeminiSouth Telescope in Chile, showed the unusual chemical composition. "Typically,dust debris around other stars, or our own sun, is of the olivine, pyroxene, orsilica variety ? minerals commonly found on Earth," said Carl Melis, wholed the research while a graduate student at UCLA. "The material orbitingHD 131488 is not one of these dust types. We have yet to identify what speciesit is ? it really appears to be a completely alien type of dust." Melis andhis team think that the most plausible explanation for the presence of the warmdust is a recent collision between two rocky planetary-mass bodies. While thewarm dust is located at a distance from HD 131488 comparable to that betweenthe Earth and the sun, Melis and his team also found cooler dust about 45 timesfarther out. This distance is analogous to the Kuiper Belt in our own solarsystem. The detection of both cold and warm dust around a young star isunusual, the team noted. "Althoughdusty telltales of planetaryformation processes in the outer regions surrounding young stars have oftenbeen seen with infrared-sensitive space telescopes, for some reason stars thathave large amounts of orbiting warm dust do not also show evidence for thepresence of cold dust," said Benjamin Zuckerman, also of UCLA. "HD131488 dramatically breaks this pattern." 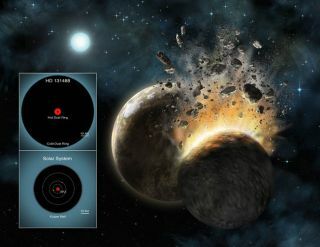 The coolerdust likely did not result from planetarycollisions, and is instead probably the leftovers of planet formation thattook place farther away from the sun, Melis said. HD 131488joins five other stars with masses a few times larger than the sun that showevidence of dust in their terrestrial planet zones. All five are young stars,around 10 million to 30 million years old (the sun, by comparison, is 4.5billion years old). "Thisfinding indicates that the epoch of final catastrophic mass accretion forterrestrial planets, the likes of which could have resulted in the formation ofthe Earth-moon system in our own solar system, occurs in this narrow age rangefor stars somewhat more massive than our sun," Melis said. The teamplans to further study HD 131488 to try and determine what strange mineralsmake up its dust, as well as look for evidence of rocky planet formation aroundother stars. More dustyevidence of planet-forming disks around other stars has also been found aroundstars that are much heftier than the sun. XavierKoenig of the Harvard-Smithsonian Center for Astrophysics and his colleaguesexamined the star-forming region called W5, which lies about 6,500 light-yearsaway in the constellation Cassiopeia. They lookedat over 500 type A and B stars, which are stars about two to 15 times moremassive than the sun. Around one-tenth of those stars, the astronomersfound evidence of dusty disks. And of those, 15 disks showed signs of clearingthat suggest that newborn Jupiter-sized planet are sucking up some of the dustymaterial as they form. "Wethink we've found evidence for planets forming around stars twice the mass ofthe sun, and even bigger stars," Koenig said. Becausethese stars are only 2 million-to-5 million years old (our sun is middle-agedby comparison), and the fierce stellar winds from them are expected to rapidlydestroy any dust disks around them, the new findings indicate that planets mustform quickly or not at all ? at least around more massive stars. Theunfriendly nature of these possible planetary systems combined with the shortlifetimes of these stars (around 10 million to 500 million years) means thatthese systems are unlikely to harbor any higher forms of life. "Thesestars aren't good targets in the hunt for extraterrestrials," Koenig said. But thesesystems will help astronomer to learn more about planet formation across thebroad range of stellar systems in our galaxy. "Wewant to understand what kind of planets form in what stellar systems,"Koenig said. And if the evidence his team found holds up, "this will tellus that planet formation is both a natural and common result of starformation," he added.